Hi there! Did you know that Neptune had a prominent satellite, i.e. Triton, on a retrograde orbit? This is so unusual that it is thought to have been trapped, i.e. was originally an asteroid, and has not been formed in the protoneptunian nebula. The study I present you today, Triton’s evolution with a primordial Neptunian satellite system, by Raluca Rufu and Robin M. Canup, explains how Triton ejected the primordial satellites of Neptune. This study has recently been published in The Astronomical Journal. We are tempted to see the two planets Uranus and Neptune as kinds of twins. They are pretty similar in size, are the two outermost known planets in the Solar System, and are gaseous. A favorable orbital configuration made their visitation possible by the spacecraft Voyager 2 in 1986 and 1989, respectively. I show on this table the main satellites of Uranus, and we can see that the major ones are at a reasonable distance (in Uranian radius Ru) of the planet, and orbit almost in the same plane. The orbit of Miranda is tilted thanks to a past mean-motion resonance with Umbriel, which means that it was originally in the same plane. So, we can infer that these satellites were formed classically, i.e. the same way as the satellites of Jupiter, from a protoplanetary nebula, in which the planet and the satellites accreted. An exception is Sycorax, which is very far, highly inclined, and highly eccentric. As an irregular satellite, it has probably been formed somewhere else, as an asteroid, and been trapped by the gravitational attraction of Uranus. Yes, the main satellite seems to be an irregular one! 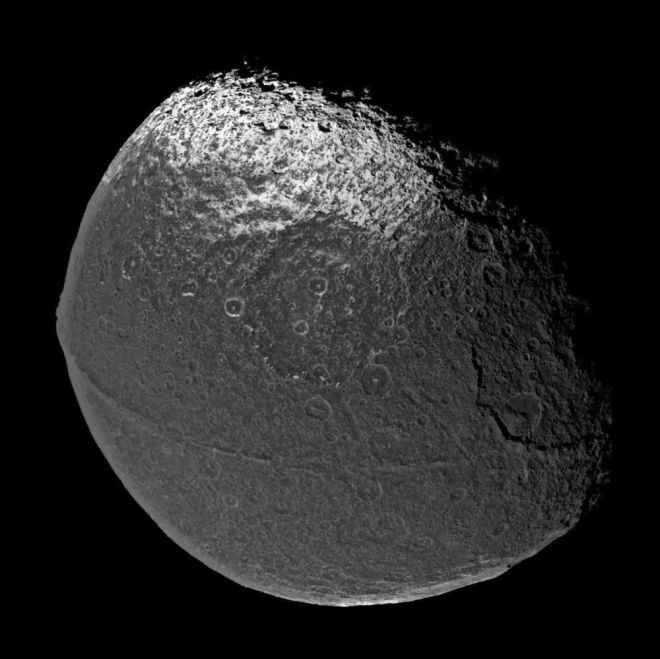 It does not orbit that far, its orbit is (almost) circular, but its inclination is definitely inconsistent with an in situ formation, i.e. it has been trapped, which has been confirmed by several studies. Nereid is much further, but with a so eccentric orbit that it regularly enters the zone, which is dynamically perturbed by Triton. You can also notice the absence of known satellites between 4.78 and 14.41 Neptunian radii. This suggests that this zone may have been cleared by the gravitational perturbation of a massive body… which is Triton. The study I present you simulates what could have happened. Before that, let us look at Triton. The system of Neptune has been visited by the spacecraft Voyager 2 in August 1989, which mapped 40% of the surface of Triton. Surprisingly, it showed a limited number of impact craters, which means that the surface has been renewed, maybe some 1 hundred of millions of years ago. Renewing the surface requires an activity, probably cryovolcanism as on the satellite of Saturn Enceladus, which should has been sustained by heating. Triton was on the action of the tides raised by Neptune, but probably not only, since tides are not considered as efficient enough to have circularized the orbit. The tides have probably been supplemented by gravitational interactions with the primordial system of Neptune, i.e. satellites and / or disk debris. If there had been collisions, then they would have themselves triggered heating. As a consequence of this heating, we can expect a differentiated structure. Moreover, Triton orbits around Neptune in 5.877 days, on a retrograde orbit, while the rotation of Neptune is prograde. This configuration, associated with the tidal interaction between Triton and Neptune, makes Triton spiral very slowly inward. In other words, it will one day be so close to Neptune that it will be destroyed, and probably create a ring. But we will not witness it. This study is essentially numerical. It aimed at modeling the orbital evolution of Triton, in the presence of Nereid and the putative primordial satellites of Neptune. The authors assumed that there were 4 primordial satellites, with different initial conditions, and considered 3 total masses for them: 0.3, 1, and 3 total masses of the satellites of Uranus. For each of these 3 masses, they ran 200 numerical simulations. The simulations were conducted with the integrator (numerical code) SyMBA, i.e. Symplectic Massive Body Algorithm. The word symplectic refers to a mathematical property of the equations as they are written, which guarantee a robustness of the results over very long timescales, i.e. there may be an error, but which does not diverge. It may be not convenient if you make short-term accurate simulations, for instance if you want to design the trajectory of a spacecraft, but it is the right tool for simulating a system over hundreds of Myrs (millions of years). This code also handles close encounters, but not the consequences of impacts. The authors bypassed this problem in treating the impacts separately, determining if there were disrupting, and in that case estimated the timescales of reaccretion. The authors found, consistently with previous studies, that the interaction between Triton and the primordial system could explain its presently circular orbit, i.e. it damped the eccentricity more efficiently than the tides. Moreover, the interaction with Triton caused collisions between the primordial moons, but usually without disruption (hit-and-run impacts). In case of disruption, the authors argue that the reaccretion would be fast with respect of the time evolution of the orbit of Triton, which means that we could lay aside the existence of a debris disk. Moreover, they found that the total mass of the primordial system had a critical role: for the heaviest one, i.e. 3 masses of the Uranian system, Triton had only small chances to survive, while it had reasonable chances in the other two cases. Something frustrating when you try to simulate something that happened a few hundreds of Myrs ago is that you can at the best be probabilistic. The study shows that a light primordial system is likelier to have existed than a heavy one, but there are simulations with a heavy system, in which Triton survives. So, a heavy system is not prohibited. The study, which is available as free article. The authors probably paid extra fees for that, many thanks to them! You can also look at it on arXiv. The Homepage of Robin M. Canup. Before closing this post, I need to mention that the title has been borrowed from Matija Ćuk (SETI, Mountain View, CA), who works on this problem as well (see these two conference abstracts here and here). Hi there! We, Earthians, are regularly visited by periodic comets, the most famous one being probably 1P/Halley, which will visit us in 2061. Since we cannot wait, we study others of that kind. Today I tell you about 49P / Arend-Rigaux. This is the opportunity for me to present you The rotation and other properties of Comet 49P/Arend-Rigaux, 1984 – 2012, by Nora Eisner, Matthew M. Knight and David G. Schleicher. This study has recently been published in The Astronomical Journal. The comet 49P / Arend-Rigaux has been discovered in February 1951 at the Royal Observatory of Belgium, by Sylvain Arend and Fernand Rigaux. It is a periodic comet of the Jupiter family, i.e. with a period smaller than 20 years. Its period is actually 6.71 years, its semimajor axis 3.55 AU (astronomical units, 1 AU being 150 millions km, i.e. the Sun-Earth distance), its eccentricity 0.6, and its orbital inclination 19°, with respect to the ecliptic. These numbers are extracted from the JPL Small-Body Database Browser, and are calculated at the date Apr 6, 2010. I have plotted below the distances Sun-comet and Earth-comet. The distance to the Sun clearly shows the periodic variations. The orbit of the Earth is at 1 AU, the one of Mars at 1.5 AU, and the one of Jupiter at 5.2 AU. Every 6.71 years, the comet reaches its perihelion, i.e. minimizes its distance to the Sun. This proximity warms the comet and provokes an excess of cometary activity, i.e. sublimation of dirty ice. At these occasions, the distance with the Earth is minimized, but with variations due to the orbital motion of the Earth. We can see for instance that the comet gets pretty close to the Earth in 1951 (when it was discovered), in 1984, and in early 2032. These are favorable moments to observe it. The paper I present you today is mainly (but not only) based on photometric observations made between January and May 2012, at Lowell Observatory. Lowell Observatory is located close to Flagstaff, AZ (USA). It was founded by the famous Percival Lowell in 1894, and is the place where Clyde Tombaugh discovered Pluto, in 1930. Among its facilities is the 4.28 m Discovery Channel Telescope, but most of the data used in this study were acquired with the 1.1 m Hall telescope, which is devoted to the study of comets, asteroids, and Sun-like stars. The authors also used a 79 cm telescope. The observations were made in the R(ed) band. Magnitude of 49P / Arend-Rigaux measured in April 2012. Of course, the data have holes, since you cannot observe during the day. Moreover, the comet needs to be visible from Arizona, otherwise it was just impossible to observe it and make any measurements. We can see a kind of periodicity in the magnitude, this is a signature of the rotation of the comet. Most of the planetary bodies are kinds of triaxial ellipsoids. Imagine we are in the equatorial plane of one of them. We see an alternation of the long and short axes of its equatorial section. If the albedo of the surface element we face depends mainly on its curvature (it depends on it, but mainly may be an overstatement), then we should see two peaks during a period. As a consequence, the period of the lightcurve we observe should be half the rotation period of the comet. 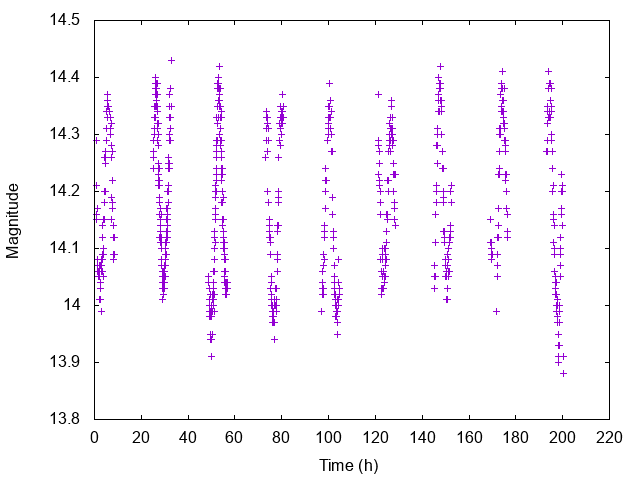 In combining all the measurements, the authors managed to derive a rotation period of 13.45 ± 0.01 hour. For that, they used two different algorithms, which gave very close results, giving the authors confidence in their conclusions. 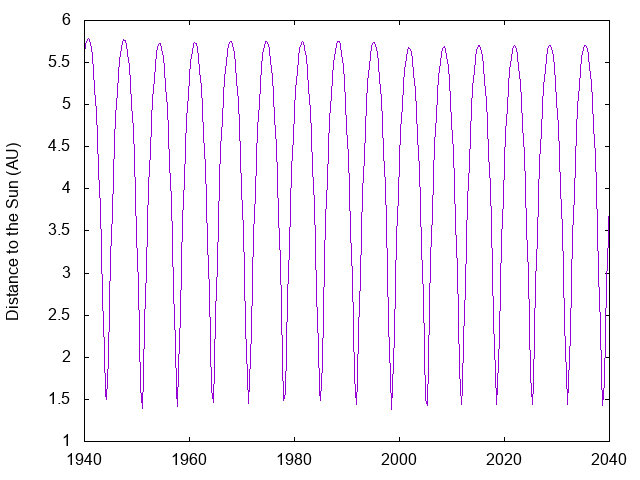 The first one, Phase Dispersion Minimization (PDM), consists to assume a given period, split the measurements into time intervals of this period, and overlap them. The resulting period gives to the best overlap. The other algorithm is named Lomb-Scargle, following its authors. It is a kind of Discrete Fourier Transform, but with the advantage of not requiring uniformly sampled data. In addition to this rotation period, the authors detected an increasing trend in the 2012 data, as if the spin of the comet accelerated. This is in agreement with an alteration of the measured rotation from the Earth, which moves, and reveals a retrograde rotation, i.e. an obliquity close to 180°. In other words, this is an illusion due to the motion of the observer, but this illusion reveals the obliquity. 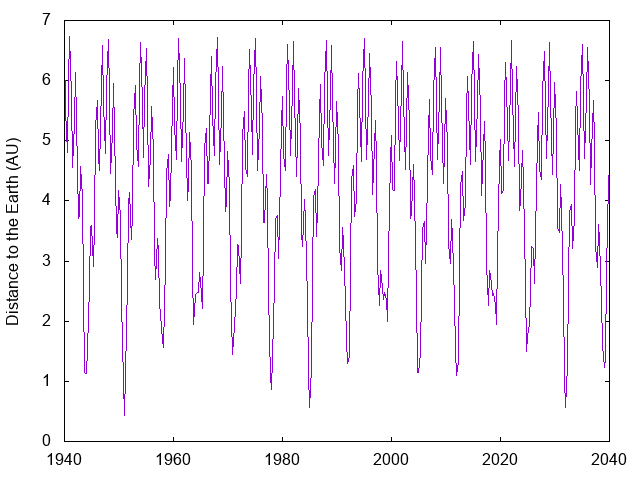 Moreover, in comparing the 2012 data with the ones of 1984, the authors managed to detect a variation in the rotation period, not larger than 54 seconds. This is possible regarding the fact that the comet is altered by each perihelion passage, since it outgasses. In this case, that would imply a change of at the most 14 seconds of the rotation period between two passages. Such variations have also been detected for at least 4 other comets (2P/Encke, 9P/Tempel 1, 10P/Tempel 2, and 103P/Hartley 2, see Samarinha and Mueller (2013)). Finally, since the lightcurve is a signature of the shape as well, the authors deduced from the amplitude of variation that the axial ratio of the nucleus, i.e. long axis / short axis, should be between 1.38 and 1.63, while an independent, previous study found 1.6. 49P / Arend-Rigaux has a low activity. Anyway, the authors detected an event of impulse-type outburst, which lasted less than 2 hours. The analysis of the coma revealed an excess of cyanides with respect to the 1984 passage. Moreover, 49P / Arend-Rigaux is the first comet to show hydroxyde. and the one of Dave Schleicher.